Available now, Design Coordination plans to simplify the BIM coordination process by housing all access and coordination issues within Procore. Users will be able to integrate their existing BIM products into Procore, assign ownership of items to various team members, elevate any coordination issues to RFIs, and track issue status directly in the Procore platform. Live syncing through Navisworks plugins will allow for issue coordination in real time. Like all Procore products, Design Coordination is a separate from the others, like Project Management, Quality & Safety, and Construction Financials. Each product is purchased separately. In addition to Design Coordination, Procore also gave Groundbreak attendees a sneak peak at a program that will be available within Design Coordination in the future, called Model Viewer. 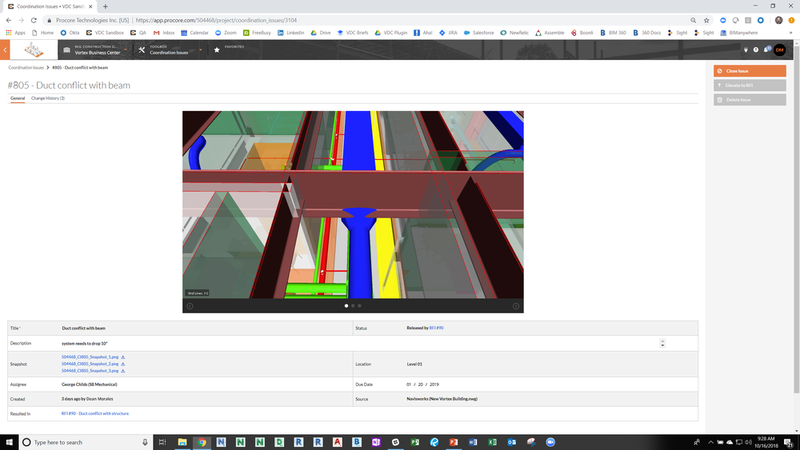 Model Viewer aims to make navigating through 3D BIM models less daunting for those not using it every day, like foreman and superintendents. Two cool features of the viewer are: 3 joy sticks, including an “elevator” joy stick that allows you to move north and south on the model and a tap and hold function that zooms into a specific area on the model automatically by selecting the area on the corresponding 2D floor plan. There is no release date set for model viewer, but Procore hopes to make it available some time in 2019. I was able to grab some video of how it worked and it was definitely a crowd pleaser at the event. Perhaps the thing that made these developments possible was Procore’s recent acquisition of BIManywhere, which was announced in September. The co-founders of BIManywhere, Peter Wu and Winson Chu, have also joined the Procore team as part of the deal. The duo started BIManywhere in 2012 and built their platform into a mobile 3D BIM model viewing engine. It was stressed to the audience several times that the announcements mentioned above were the result of only 2 months of partnership with BIManywhere, a nod that there is plenty more to come in the future. There is more coverage of Procore Groundbreak to come, so please be sure to check back next week! Tracking progress on any construction progress is an extremely vital step. Artificial intelligence is gaining popularity in the industry, as it can make sense of thousands of images or videos and place them into context. Before the AI can work its magic, though, all of those pictures and videos must be collected. That’s where robotics masters Boston Dynamics thinks they can step in with a robot they’ve been developing for years. Fatigue on the jobsite is real, so much so that many technology companies have developed products to reduce fatigue and also sense when a worker is experiencing fatigue. There are other wearable devices, like exoskeletons, that can enhance a workers strength and stamina, but when you need to add more than a little punch, Construction Robotic’s MULE 135 may do the trick. For over 3 years now, Trimble has been teaming up with Microsoft to make the mixed reality headset, the Microsoft HoloLens, a viable and useful tool for the construction industry. With Microsoft’s recent announcement of their next-gen headset, the HoloLens 2, Trimble also made an announcement about the impending release of a new wearable hard hat compatible device featuring the HoloLens 2. Falls continue to be the number one leading cause of death on construction sites across the country, accounting for around 40% each year. Even if you can convince your construction crew to wear personal fall arrest systems each time they’re required, proper training is required to select the correct type of fall protection and the anchor points, as well as performing proper inspections of the equipment. An app called Harness Hero is trying to help solve the latter problem. How do you use your construction contract as a means to get that precious data you need? [guest post] Construction project owners are facing a big problem: paper based progress reports and invoices are making it nearly impossible to quickly find and address errors. The tool kit of the past included a magnifying glass, a pencil (and eraser) and a calculator. Armed with endless human resources, project owners would diligently review paper based documentation for discrepancies. This MO is no longer feasible in the modern construction environment. JBKnowledge, a construction technology and consultancy company, has been producing their annual Construction Technology Report since 2012. Now in its 7th year, it is far and away the most comprehensive collection of survey results in the construction technology sector. I’m a strong proponent of reducing the amount of pen and paper used on construction jobsites. Handwriting notes is great for personal use, but as soon as you need to get those notes or reports to someone else, you either spend time duplicating your work on a computer or never get around to communicating, because your notes were misplaced, destroyed, or illegible. Fieldwire, a field software for collaborating on plans, punch lists, and scheduling, among others, has recently announced the release of a custom form building tool to reduce the need for paper on your jobsite. As much as we like to push for the digitization of the construction jobsite on Construction Junkie, there’s no doubt that there are many within the construction workforce that are still apprehensive to go fully electronic. There’s something to be said for feeling and manipulating something with your hands, as opposed to pointing and clicking. SlatPlanner is a new way that construction companies can electronically build a project schedule, while maintaining a hands-on approach.